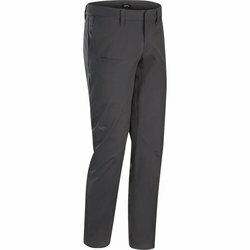 ARC'TERYX Abbott Pant. Comfortable and versatile, the trim-fitting Abbott Pant moves easily from work to weekend. Durable, water and stain resistant, the cotton blend twill has stretch to add comfort and hold the fit. Hand pockets, two rear pockets and a subtle zippered thigh pocket provide storage.